Many of us know that some birds trick other Host parents from a different Species into rearing their young. Best known is the common cuckoo in the UK and much of mainland Europe, However, this type of deception is not only the forte of birds – many insects are ‘brood parasites’ too, especially ants, wasps, and bees. If you have a garden with a lawn, you may be lucky enough this spring and summer to find small mounds of earth in little groupings over its surface. While these might seem like miniature ant hills or worm casts, they are often actually the work of solitary bees. One such species is Lasioglossum calceatum, with individuals living alone in their burrows, often seen bringing back pollen to provision their young. Unfortunately for these endearing little bees, they attract an unwelcome visitor – a cuckoo bee called Sphecodes monilicornis. This species looks rather different from the dull brown of its host, mostly black with a vivid red abdomen. The female cuckoo bee lurks in the vicinity of the host nests, entering the burrow when the resident is away and laying an egg of her own. She needs to be secretive because many solitary bees that are targeted by cuckoo species violently fight them off if they catch an intruder in the act. If the cuckoo is successful, her egg will hatch, kill off the host’s own developing young, and devour the pollen stores for itself. Needless to say, this isn’t good news for the host parent because it just wasted a lot of time and energy to provision young that did not survive. Many bees are ‘cuckoo’ species, laying their eggs in the nests of other species and exploiting their resources. 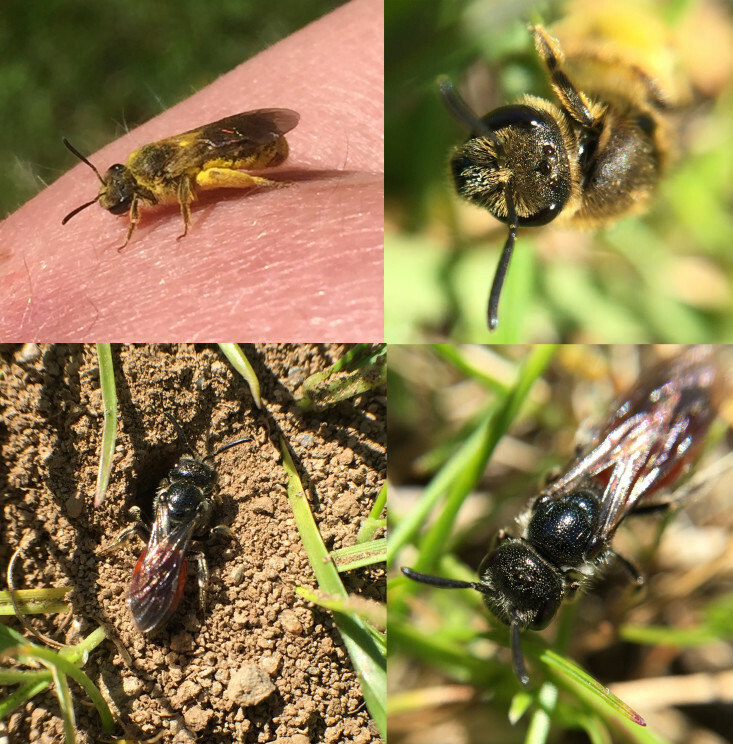 Here, the solitary bee Lasioglossum calceatum (top) is being used by the cuckoo bee Sphecodes monilicornis (bottom). The cuckoo visits the burrows of the host while they are away. Photograph by Martin Stevens. Do not use this image without permission. Each solitary bee is often targeted by one or more species of cuckoo bee. In many cases, the key to the cuckoo’s success is not just in being secretive, but deceptive too. Owing to the fact that many hosts evolve defences to repel intruders, the cuckoos have in turn evolved methods of attack that circumvent these – a sort of evolutionary arms race. They are often well defended with thick body cuticle and powerful stings to survive physical violence, and many cuckoo species mimic the smell of their hosts. In fact, research has shown that in some species, hosts are less aggressive towards cuckoos whose mimicry is better. All in all, probably 15% or more of bee species are cuckoos, though much of their biology and parasitic behaviour is little known. While Cuckoo Bees have a fascinating way of reproduction, some insects are more extreme. Chief among these are the slave-maker ants, which use workers of other species to raise their young and perform tasks in and outside of the nest. Colonies of slave-maker ants arise when a queen ant invades an existing nest of another species, ousting or killing the resident queen and workers (such as is the case with the European slave-maker ant Harpagoxenus sublaevis). She’s left with the developing brood, which as they develop imprint on the chemical profile of their new queen, and later become the workers. Once the enslaved ants have matured into workers, the queen can set about laying eggs of her own offspring, which are reared by the enslaved workers. These slave-maker young have one sole job – to raid the nests of other species (sometimes several different species) to steal more young. The act of raiding other ant nests by slave-makers is equally remarkable. Scouts initially find a suitable nest to attack, after which the raiding ants invade on mass. The under attack hosts have two options: turn and flee or fight. The former inevitably means that some brood are captured, but with low casualties, whereas the latter often involves considerable loss of life on both sides. In such cases, raiding is dangerous for the slave-makers too. However, their specialisation for this task enabled them to evolve an arsenal of tools for success. First, they often possess strong mandibles that can literally snip the heads off the host workers. Second, like cuckoo bees, slave-maker ants have a special chemical-producing gland (Dufour’s gland). Its products can somehow calm the aggression of the hosts, or mimic the alarm pheromones of the hosts, causing them to ‘panic’ and flee, or even manipulate the host workers to turn on and attack each other. Cuckoos, cuckoo bees, and slave-maker ants highlight how far many species will go to avoid paying the costs of rearing their own young. The puzzle is that the strategy of tricking others to rear young of another species is common in these groups, but virtually unknown elsewhere – why? Unfortunately, we don’t know. In mammals, internal gestation means that brood parasitism is not an option, but plenty of other species lay eggs. It may be that we just haven’t detected it in other taxa yet, or that there is something in the ants, bees, and wasps and the birds that facilitated its evolution. Charles Darwin suggested in On the Origin of Species that slave-maker ants have evolved from predatory ants who then brought brood back to the host nest. It’s a plausible idea, though would not seem to apply to cuckoo bees or avian parasites. One thing is for sure – we have lots left to understand about how this strategy works and how hosts can fight back. Featured image credit: Polyergus lucidus returning from raid on Formica incerta. Photo by James C. Trager. CC BY-SA 3.0 via Wikimedia Commons. The post Enslaved ants and cuckoo bees appeared first on OUPblog.